My favorite survival cookware are cast iron pans. For anyone who is unfamiliar with cast iron, they are the black heavy iron pans that have been around for hundreds of years. They must be “seasoned” or coated with oil or they can rust. But a pan that is used constantly and kept dry after use will last for generations. My mother-in-law actually introduced me to cast iron pans. Whenever I helped her cook anything in her kitchen, I marveled at how the cast iron pans cooked everything so well, retained heat evenly and performed like nonstick pans. In those days, I used teflon pans, but they peel and shred after a while. Teflon pans were also found to pose a health hazard. If overheated, they release a chemical: perfluorooctanoic acid (PFOA), known to cause cancer and birth defects in animals, according to a Consumer Reports article. I tossed out all my teflon pans and asked my mother-in-law to help me find some cast iron pans. She did not take me to a cookware store; instead she took me to Goodwill. She said she found the best seasoned cast iron pans there. In those days, new cast iron pans were not pre-seasoned and you had to work on it a while. But people would toss them out thinking they were inferior to Calphalon or other name brand cookware. If you are in the market for one, try second-hand stores like Goodwill first. Only buy it is if you find a slightly rusted cast iron pan, all it needs is a little TLC. The same process to salvage it, is the same process to season a new pan. If you have a new pan, just wash and rinse, no scraping needed. If you are working with a used, slightly rusted pan, wash with a strong dishwashing liquid and scrape out the rust with a steel wool. Dry completely with a dish towel. Turn the oven on low heat, around 250 degrees and leave the pan in the oven for 4 hours. Do not leave unattended. It may get a bit smoky if the heat is too high. Turn of the heat and leave the pan in while it cools. Repeat the process over a few months until the pan turns black. You now have a well-seasoned pan. As a benefit for us preppers, they can be used over an open flame in an emergency, and will cook evenly. Also, use of the pan adds iron to your food, which helps avoid an iron deficiency. Because they will last a lifetime, you don’t need to spend money for replacement pans. 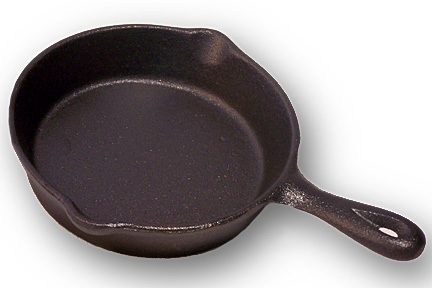 Cast iron pans are now available pre-seasoned. You don’t have to go through the process if you don’t feel like it. Just remember the pan should not be left sitting in a sinkful of water. It should be rinsed and dried after use and coated with a thin layer of oil. They are still fairly inexpensive, around $10 for a non-seasoned pan, and about $20 for a pre-seasoned one. Since I am still new at prepping, I know I still need a few more items to round out the survival cookware. Leon over at Survival Common Sense has an excellent article about Dutch ovens. Check it out at http://www.survivalcommonsense.com/2010/09/27/dutch-oven-survival-kitfeed/ . I have not tried Dutch ovens but will not add it to my list, along with the sun oven. Once I try them, I will be sure to post about my experience.